Valerie Brender was an IILJ Scholar from 2009-2012. After receiving her J.D. from NYU Law in 2012, she went on to work as a research fellow at Human Rights Watch. 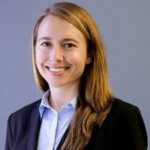 She is currently an associate at Rukin Hyland where she litigates class and collective action employment law cases, including misclassification, wage and hour, and discrimination cases. She also advises executives on employment and severance agreements during job transitions and litigates individual civil rights, wrongful termination, and whistleblower cases.